Sjælsmark contains people whose applications for asylum have been rejected but cannot be returned to their country of origin (technically “non-deportable rejected asylum seekers,” according to EU law). The upscale suburb has no shops or other amenities for the detainees. It is suitably remote from the city, nearly two hours by two buses and a train. By car, it’s just 30 minutes, but no one has a car. Thirty-year-old Lily was born in a territory that was Ethiopia and is now Eritrea; she and her 7-year-old son, Liam, showed me around (their names have been changed at their request.) The camp is accessed through a formidable gate, which is locked every night at 10 pm, even to residents. Families live in former military barracks. The residents call it a “camp,” and it is newly surrounded by 10-foot-high security fences. Although residents can leave whenever they want, the goal is to create the effect of imprisonment. Rejected asylum seekers are in legal limbo. Some of them are stateless and deprived of what Hannah Arendt called “the right to have rights.” They are denied as citizens by their “home” countries and the EU refuses to recognize them as refugees, so they have no legal status anywhere. Like many others, Lily was denied leave to remain in Denmark because her fingerprints were first taken in Greece. Under the EU’s Dublin Regulation, the first country where an asylum seeker is fingerprinted must process them for asylum. If the Danish settler colony once wanted to extract labor from its colonial subjects in the Caribbean, Africa, and Asia, all it wants now from their descendants is that they go away. To that end, Sjælsmark residents cannot work or claim benefits. They are not allowed to cook, to have furniture (other than a bed, one table, and hard chairs), or to decorate their rooms. No carpets or rugs are allowed. There is no television or Internet service. Residents live in cold, spare rooms with very high ceilings. Having committed no crime, the asylum seekers are nonetheless being punished. When I entered her room, Lily had arranged hot water to make tea or instant coffee and spread a paper plate with a packet of saltines. It was heartbreaking: Not because she had relatively little to offer, but because it made clear that the intent of the Danish state was to deny her the human impulse to hospitality. Like many prisoners, the residents are above all concerned about food. The Prison and Probation Service provides food that is prepared off-site and reheated. It was described to me by everyone as inedible. Conditions in the cafeteria are so bad that all visitors are banned. No food is brought to people who are sick or pregnant and so cannot walk to the cafeteria. No allowance is made for dietary preference. In the Danish prison system, and the reception camps where asylum seekers are first sent, cooking is allowed. Not here. The Jamaican sociologist Orlando Patterson coined the term “social death” to refer to enslavement. It equally applies to what the Danish state is trying to do to asylum seekers. A Palestinian visitor was sufficiently shocked by what he saw to say that conditions were worse than in the Israeli prison where he had been incarcerated. This condition of social death even extends to the more than 100 children in the camp. They cannot play on the grass or anywhere outside but a tiny playground. They are not allowed to attend Danish schools but must go to a kindergarten-level facility organized by the Red Cross no matter what their age. The only activity offered there is coloring. And so Lily accurately called the refugees’ situation “torture.” It is not physical torture intended to extract information; it is psychological torture designed to humiliate and produce action. Lily and other residents thought that the state wanted them either to go underground or “run”—meaning seek an inevitable rejection for asylum elsewhere. Although both actions are illegal, they would fulfill the state mission of having refugees disappear. From within this social death, the refugees have nonetheless organized. They are holding weekly demonstrations against their conditions, including a hunger strike. At a rally in Copenhagen on December 5, Lily spoke out: “We have a right to seek asylum in Denmark and we also have the right to live a normal life until solutions are found for our cases.” Denmark seeks to deny those rights. More exactly, it denies that they exist. There is proposed legislation to mitigate the worst of these conditions. It will require 50,000 signatures in a country of 5 million. 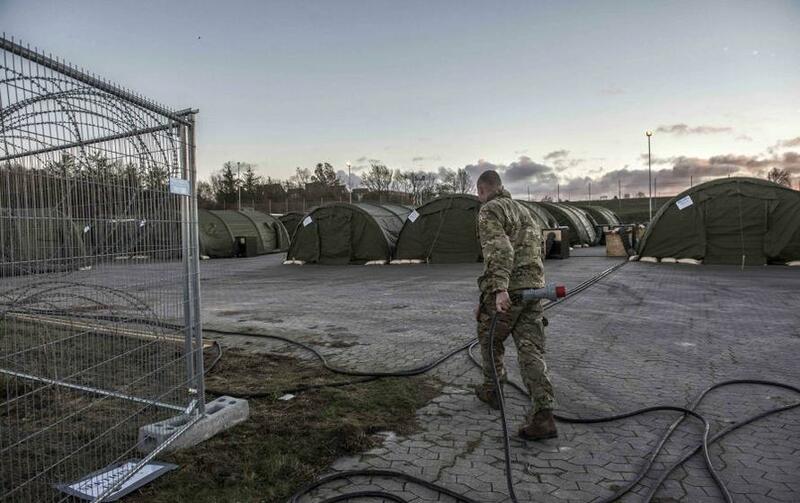 It would still require asylum seekers to spend two years in Sjælsmark, which is unacceptable: The only way to end social death is the abolition of such camps. In response to this opposition, the Danish government has taken more aggressive steps still. Adopting the Australian strategy of intercepting and offshoring refugees on Nauru, it now intends to house failed asylum seekers on the remote island of Lindholm. Denmark, then, is refining its psychological torture by subjecting asylum-seekers to isolation and exclusion. From the US perspective, Trump’s clownish brutality is bad enough, but the Europeans are devising something arguably worse; abolishing detention camps completely is the only way out.